This weekend was a tough weekend to get out to the course. As my last weekend as a free man (I got a job this past week, so I was prepping for that. I’m pretty happy about the job, but just need to get use to not having a free schedule), I had some things to do that kept me from the course. However, I did get a nice surprise discovering that my cousin disc golfs. And on top of that, I found that two of his kids (he has three kids, but one is like four months old) have quite the knack for throwing a disc. Which brings me to the topic of kids and disc golfing. I’ll probably discuss it more than once, but for now we will narrow it to the use of the disc golf basket and a bored Saturday afternoon. My wife’s cousins were at the house planning for their wedding (see Weekend of disc golf!) and one of her cousins has three kids (like I mentioned above). While the ladies were planning for the wedding, it was up to the guys to find something to do. I suggested pulling out the disc golf basket and tossing some discs at the yard. The plan was immediately accepted. With the same eight discs that I discussed practicing with earlier (see Tossing in the basket) we headed out to the backyard and started tossing at the basket. It turned out to be perfect. And I found that they were pretty good at it. They loved doing it, throwing the disc as hard as they could. Running to get all of the discs to have more than the other, seeing if they could hit the garage, and trying to get the small soccer ball into the basket, it was a great way to introduce them to disc golf. Since the basket wasn’t a couple hundred feet from the pad, it gave them a clear goal: hit the chain and get the disc in the basket. Plus, it helped me to try to teach them how to throw the disc and what to aim for. They did really well too. No, they didn’t get the disc in the basket every time, but they got it in just as much as me or my cousin-in-law. One of them was a natural for a side arm throw, he picked up the disc and just started throwing it that way, I didn’t want to stop him, because he was really good. So, here is my statement: get kids out to the course! Take them to the park and spend an hour or two on a game of disc golf. I have found that most places have a smaller course around, usually with nine holes (contact me and I can help you find that course), and they are usually no more than 200 ft per hole. Just give them one disc each (probably a mid-range, like a Shark) and have fun. Or if there isn’t a course, maybe you know somebody with a basket. Just do what I did, set the basket up in the yard and give them a game, maybe have them try to get the disc in the basket first. I think it’s a good thing to have kids trying out disc golf. Maybe they will keep it up and continue as they get older. And these kids will become pros one day. Plus, maybe these kids will help get it even more popular and possibly get disc golf on TV. Some might not want disc golf to get anymore popular than it is, but I don’t think it would hurt having disc golf be as popular as other sports. What do you think? Should it stay a little underground? Or is it fine if more people pick up the sport? I believe now would be a good time to share with you my humble beginnings as a disc golfer and maybe a little of why I do it. I think it’s good to discuss how you started out, that way you know where the start is and maybe figure out the path you are taking. I do remember my first time out on a course, it was in the fall of 2006. My now brother-in-law, Mario, had been talking about disc golfing for a while, at the time he had been doing for a long time. 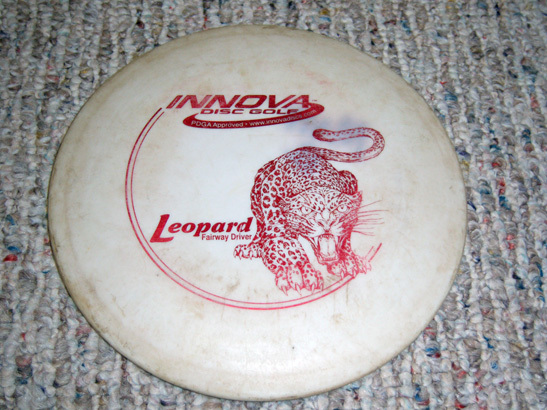 This is my Leopard disc, as you can see it's pretty well worn, but that just makes it better. on’t go into his disc golf history. (Maybe I’ll interview him sometime, just to give this blog a different voice) Anyway, the point is that he is good at it, likes doing it, and wanted to share the experience with us. So, Mario, my father-in-law, me, and maybe my other brother-in-law, Win, all got up early and drove over to Oshtemo. Mario had a lot of discs so he shared them with us, I think we each grabbed two discs, a driver and a putter. And started to tough our way through a challenging course. Probably three hours later we walked out of the forest, muddy and in love with the sport. It didn’t take long for my father-in-law and myself to go to Dunham’s Sports and pick up a disc golf starter pack. The pack came with a driver, mid-range, and putter. 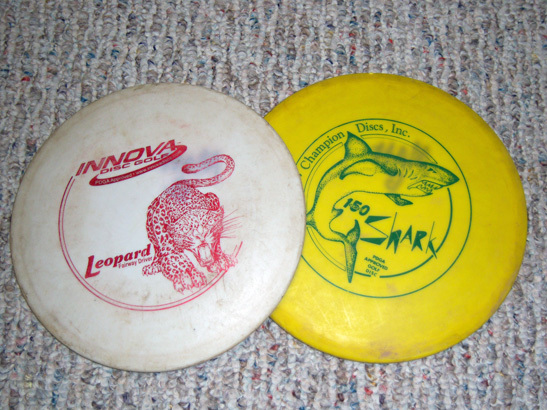 In fact I still have them: Leopard, Shark, and Aviar. (Actually, I don’t have the Aviar, I think that one disappeared in Grand Rapids) We then started going to the Oshtemo course on the weekends. I loved those three discs and it probably took another year before I bought any new ones. 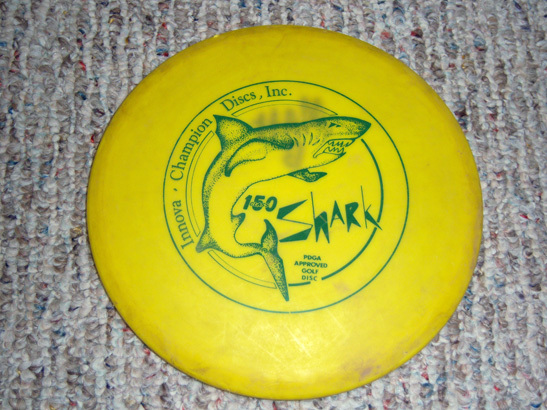 This is my Shark Disc, again, a little worn, but can't go wrong with that. As of late, it's been my favorite. The course has changed a bit since then. It used to have a lot more trees, and if you go out there now you’ll see the stumps where they used to be. They must have gotten a lot of complaints, because those trees where in some really hard spots, forcing you to throw low or really high to get around them. I remember watching Mario throw some amazing throws, the type of throws that amaze and anger you at the same time. 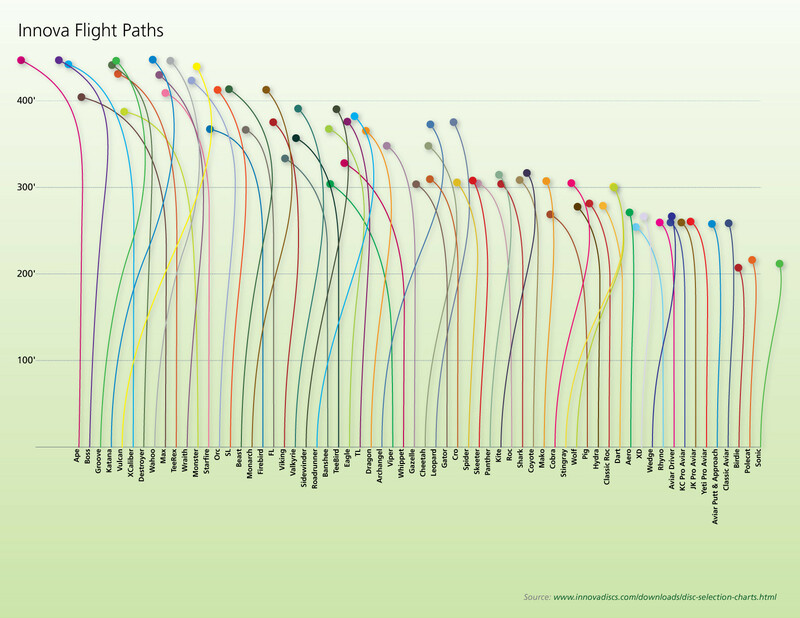 It was like he had a remote or a string to guide them around the trees. He made them look easy, and watching the way those discs flew was beautiful. I still get amazed by how the discs float in the air, it’s like art. Anyway, the important thing was that he gave us pointers and helped us figure out how to do those throws. Not saying that we did anywhere as good as he did, but at least we hobbled our way through the course. I discovered that my friend Paul liked to disc golf, so I would go with him every once in a while, and I even brought my then fiance with me. It just got into my bones and spirit. Maybe it’s why people hike or hunt, to be out in nature, away from the computers and traffic and daily grind of life, but whatever it is, you do feel really peaceful out there. It was that place in my head I would go to when working at a retail bookstore or going to college started bringing me down. I’m not saying that I didn’t get frustrated out there, trust me, when you think you have thrown an awesome throw only to have it slam into a tree truck, you are as far from peace as you can get. But, you just have to let that stuff go. We only went to Osthemo that first year getting into disc golf. I don’t know if it was because we were familiar with it or if it was the only one we knew of, but either way that was the course we used until my fiance and I graduated from Western Michigan and we moved to Crystal Lake, Illinois (not the camp that Jason haunted), but a northwest suburb of Chicago. That is the end of part 1. Part 2 shows how my love progressed for the sport and how I was able to watch a competition and meet some great athletes. Until tomorrow, I ask, what is your first disc golf memory?